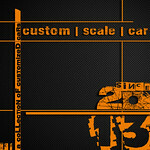 The 3rd year of CUSTOM | SCALE |CAR. 55o returning visitors, spending 3 minutes / session. The Facebook page dedicated to this blog has 115 fans, after one year of existence. gives you ”rendez vouz” for reading about new amazing miniatures!